September's been a busy one! ... I'm running about a week behind on everything at the moment, so my Portugal adventures shall have to wait for a little while (just got back, was amazing!) as I still have a lovely weekend in Brighton to witter on about. A friend of the boyfriend's was getting married in Brighton on the 15th September so we thought we might as well make a weekend out of it & have a little break at the same time. We set off bright and early Saturday morning & piled onto the train, i always find it a right treat getting an overground train through London, as I usually get off before all the exciting landmarks appear - totally beats sitting on the motorway. We then went for a stroll before heading to The Griffin guest house - our home for the next 2 days. 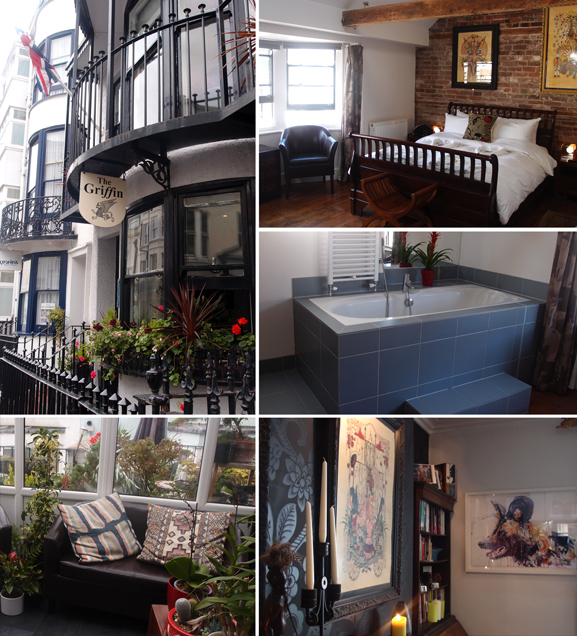 If you ever find yourself in Brighton for a weekend, stay at The Griffin! It was amazing. We treated ourselves to one of the luxury rooms with a whirl pool bath, exposed brick wall & vaulted ceiling .. It was properly nice, spotlessly clean & Chris & Kieran who run it were so lovely & helpful. The rest of Saturday was spent at Italian sea front restaurant Alfresco where the wedding reception was being held. It was a gorgeous location, right on the beach & It was mega sunny all day, we were so lucky with the weather. There was pie & mash & banoffee pie for the meal (amazing!) & band-aoke (live band & karaoke) as the entertainment ... not your average wedding! It was so laid back & fun & the evening whizzed by in a blur of cheesy music & dancing. Sunday, feeling a bit worse for wear I woke up after the most AMAZING nights sleep of my life - the bed at The Griffin deserves some sort of special award, it was literally the comfiest thing I've ever had the pleasure of sleeping on, It took a lot of persuading to get me out of it, but the lure of a soak in the whirlpool bath before a home made Full English softened the blow a little. We met up with the wedding party for a quick drink before heading off for a snack of dim sum & cake (the boyfriend had the biggest slice of chocolate cake I've ever seen) & then full & sleepy from the days exploring headed back to the guesthouse via the beach for a nap - any excuse to get back in that bed! After another amazing hour spent in our fluffy cloud like cocoon we headed out for dinner at a seafood restaurant we'd spotter earlier in the day in the lanes - Riddle & Finns. Not an overly big white & black subway tiled room with huge marble top bench tables, candelabras & chandeliers, you sit side by side & share tables with other people, which gave the whole place a really laid back friendly atmosphere. They charge £1 per person for the bread basket which includes White & brown bread, smoked mackerel pate, aioli & horseradish & you can have as much as you want - bargain! Could easily have done as a starter, but we didn't want to miss out on anything so ordered King Scallops with chorizo & chilli & Peppered Squid with lemon & parsley. They were both lush. The mains didn't disappoint either. I went for my staple favourite seafood dish & had bouillabaisse - which was FULL of fish & shellfish, It was amazing! The boyfriend had smoked mackerel with colcannon & poached egg on a bed of spinach. Clearly could have left if at that as we were both stuffed, but we'd spotted the people opposite us devouring a platter of mini desserts & decided we could just about squeeze one in if we shared - so glad we did, the chocolate brownie that made up part of it was perhaps the best chocolaty desert I've ever eaten, it was so so tasty. dinner was a success all round & having eaten enough to feed a small family we went for a stroll along the beach to walk it off. There's something about the beach at night that I love, the fact that it's like you've just hit a black wall & can see nothing but the stars & the moon gives me a strange sense of calm, where if you were elsewhere in pitch black it might be utterly terrifying! After a long walk we meandered back to The Griffin & fell into bed for our final night, full of yummy food & sea air. 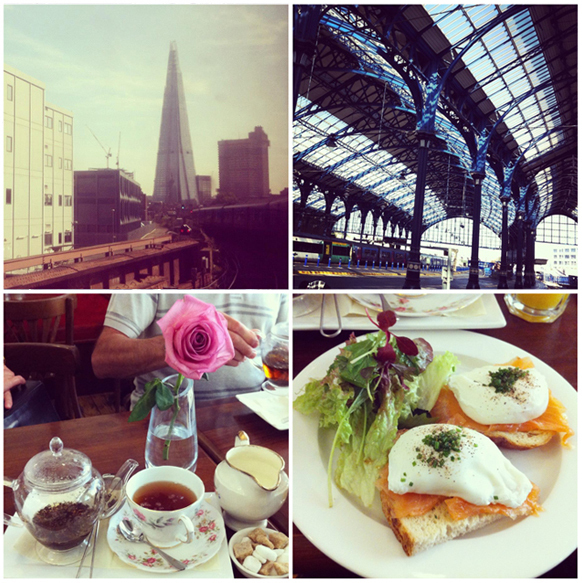 Monday was spent much in the same way as Sunday, full of beaches, shops, galleries and food. We discovered Bills restaurant - will write a post about it soon - spent far too much money for a Monday morning & took a stroll along the Pier before biding farewell to The Griffin. 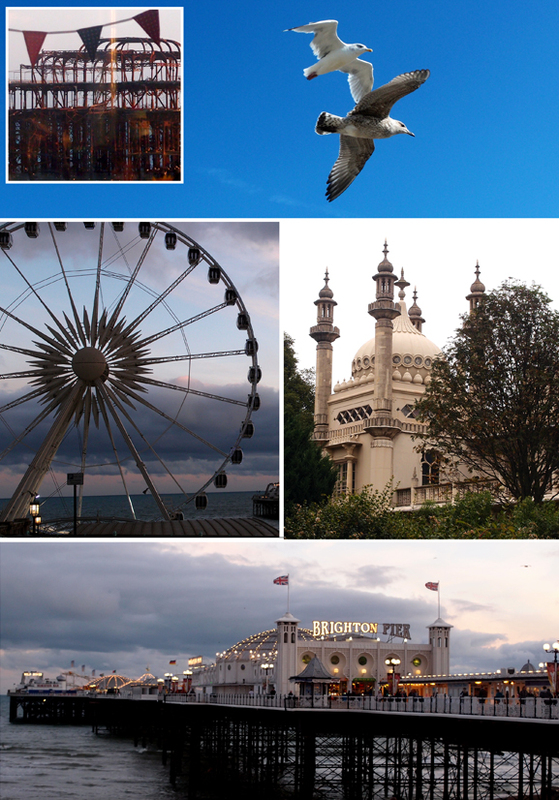 We were so sad to be going home, Brighton has tonnes to offer for a weekend away just out of London. We'll deff be going back!